The region is also perfect for being explored by bicycle, with many nature-friendly routes on offer. 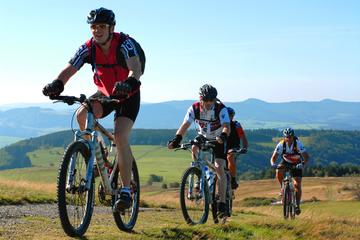 One of Germany`s biggest mountain bike trail networks extends across the Rhön with panoramic views over mountains and through valleys. There are plenty of well constructed cycle paths, such as the "Vom Main zur Rhön", the "Rhön-Radweg" and the "Milseburg-Radweg", to guide cyclists through an area rich in vegetation and species. 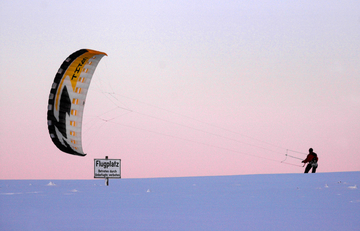 While in summer paragliders and gliding enthusiasts dominate activities on the Wasserkuppe, in winter the slopes are bustling with winter sport fans. With plenty of ski-lifts available, the Rhön is a true paradise for downhill and cross-country skiing and snowkiting. Please get more information regarding the variety of leisure activities in the Rhön through contacting us via phone or email!